Jennifer Garner, Before and After pictures by year. she has been all over the news lately after her split from husband Ben Affleck. But here on Beautyeditor, we’re more interested in her beauty evolution! Now 43 years old, Jen first rose to fame way back in 2001, age 29, as Sydney Bristow on the hit television series ‘Alias’. Soon after that, she moved over to the big screen, starring in movies such as ‘Daredevil’, ’13 Going on 30′ (my personal fave!) and most recently, ‘Dallas Buyers Club’. Over the years, Jennifer has also generated her share of plastic surgery rumours. Some say she had her lips done, some say nose, some say teeth. Let’s take a look! Jennifer Garner at the ABC Up Front party in 2001. You know, I see so many paparazzi photos of Jen in frumpy mom outfits that it’s easy to forget what a beauty she is/was. Despite the over-tweezed eyebrows, she looks so fresh and pretty. This hairstyle is SO 2001, ha! Jennifer Garner at the 2002 Golden Globe Awards. The following year, she busted out another classic early ’00s ‘do. People sure did weird things with their updos in the 2000s! Still, Jen looks great with tightlined eyes and the peachy makeup. As you can see, her lips were always quite full. Jennifer Garner at ABC’s 50th anniversary party in 2003. I’m including this one so we can get a look at her original teeth. I do think she may have done some (minor) upgrades in that area later on, as we’ll soon see. Jennifer Garner at the 2003 Academy Awards. Also from 2003 is this bronzed look. My goodness, she was buff back in the day! (And that dress looks like it hurts.) Her face shape appears much rounder here than it does today, although I don’t think she actually surgically changed it later on. Despite the ’00s styling, I quite like seeing Jen’s hair scraped tight off her face. Jennifer Garner at the Alias DVD launch party in 2004. Another look at Jen’s teeth. I think she must’ve got the usual Hollywood teeth whitening package! She was 32 here and still cute as a button. Also: I kinda wish she’d go back to this hair colour and length, plus the fresh makeup. It really suits her. Jennifer Garner at the 2004 Kids’ Choice Awards. More adorableness in that same year. She is the very definition of “girl next door.” But those brows are just calling for help. Jennifer Garner at the 2007 premiere of ‘Catch and Release’. Jen didn’t return to the red carpet until 2007, as she was off having her first baby. She was 35 here, and still pretty much sticking to her low-key makeup recipe. I don’t detect any surgical changes with her nose or anything else yet. Brows are growing back in very nicely! Jennifer Garner at the 2008 Stand Up To Cancer event. I think she might’ve been pregnant again here. See how this hair length works well for her? I also feel she looks her best when she keeps her look natural and casual—hence the disconnect with some of her glammed-up red carpet appearances lately. Jennifer Garner at the 2009 TIFF press conference for ‘The Invention of Lying’. That blush is so strong! Also, it looks like Jen’s face shape is starting to change from oval to long. That might be why I prefer her hair to be a good few inches shorter than this—too long, and it drags her face down. Jennifer Garner at the 2010 Golden Globe Awards. I think this might’ve been one of the photos that sparked a “lip injections” discussion, but I don’t think she really had them—probably just the camera caught her in an awkward expression. I do, however, suspect she started using fillers in her cheeks and Botox by this point. Her face has that slightly wooden appearance that is a telltale sign. And the dated hairdo is not helping! Jennifer Garner at the 2011 Pink Party. Everything is softened a bit here: the wavy hair, the stained berry lips, and the fact that she’s smiling. Maybe she gained a bit of weight that is filling out her face more, too. (Jen is 39 here.) If you look closely at her crow’s feet, I think they’ve been Botoxed a bit. Jennifer Garner at the 2013 premiere of ‘Dallas Buyers Club’. This lip colour is really fun, and her hair isn’t too “done” for her casual sense of style. Highlights are gorge, too. Interestingly enough, it doesn’t look like she got dental work… yet! Jennifer Garner at the 2014 Save the Children Illumination gala. In this 2014 shot, I suspect something changed. Is it just me or are her front teeth more prominent? I’m getting mild Hilary Duff vibes, so it could be veneers or laser gum surgery, I don’t know. Overall, she looks a teensy bit tight and injected—but it’s still very tasteful, and nothing like the celebs who overdo it with that stuff. The super-glam, wavy hairstyle seems to be wearing her and not vice-versa. Jennifer Garner at the 2014 American Cinematheque Awards. This is a little better on the hair front. As for her teeth, I’m still wondering! Her face does seem longer and more angular these days, but I think that’s just a normal consequence of getting older (sigh). Here, you can really see how much Jen’s lips are over-lined (not that she needs it!). One of her eyelids is a bit droopy—Botox gone wrong? I love that Jen looks younger and less conservative here than she did six years earlier, in 2010! It’s the pink lip with the red dress, and the gorgeous tousled hair. Her highlights are also excellent, and she has just enough natural movement in her face. 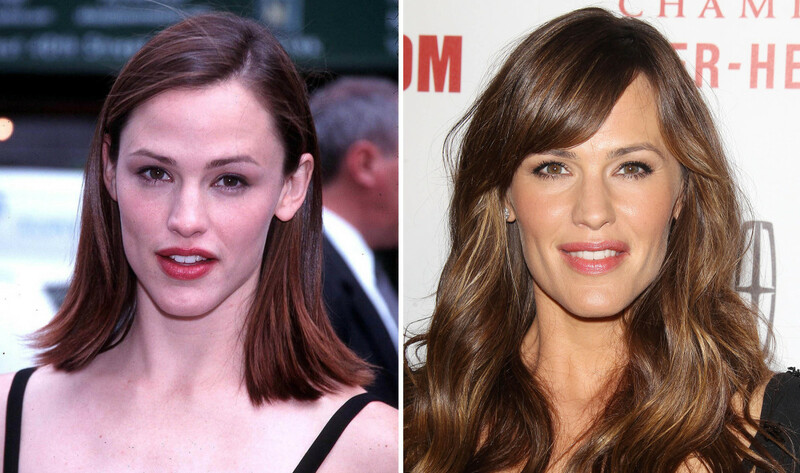 Jennifer Garner in 2001 (left) and in 2014 (right). Overall, I think Jen is aging beautifully—and as far as Hollywood goes, much more naturally than is the norm! Based on these photos (and her age), she’s no doubt dabbling in injectables now. If she did alter her nose and lips, you really can’t tell… although I suspect possible cosmetic dentistry could be the reason for the new look around her mouth.